70 years since the transistor began to change the world | What Hi-Fi? The world of 2017 without the humble transistor would be unrecognisable. Virtually every electrical appliance more complex than a lightbulb uses them - they are absolutely ubiquitous. The computer, tablet or smartphone you're using to read this is packing hundreds of millions of transistors in its processor. The lovely stereo amplifier you bought (with the benefit of our advice) features much larger transistors - they need to be, to cope with those high currents. They might even be getting on for the size of a postage stamp. By the time John Bardeen, Walter Brattain and William Shockley were preparing to turn the electrical world on its head (they'd been experimenting with gold point contacts applied to crystals of germanium since November 1947), valves had ruled the roost for decades. They were in most electrical products, from televisions and radios to early computers. But their size precluded most portable applications, and there were also issues around fragility and power consumption. The earliest computers used hundreds of these warm, glowing tubes, and (as shown above) even the simplest would take up an awful lot of space. The arrival of the transistor opened the door to a new world of products and applications. Fundamentally, it's an amplifier. 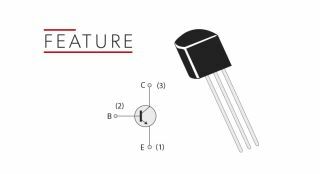 In fact, the original patent name for the transistor was Semiconductor Amplifier - at first, it used gold foil in contact with a germanium base but as it developed it utilised silicon instead. A transistor takes a signal and makes a larger copy of it (if given a suitable power source to get it working). Configured differently, a transistor can also act as a switch. These two functions may not seem all-encompassing, but in a suitably designed circuit they make all the electrical activity we both depend on and take for granted possible. It took a little while for people to recognise the transistor's vast potential. At first, applications centred around the military - but after the first transistor radios showcased the technology's light weight, robustness and portability (if not, at first, the quality of the sound it produced), domestic applications became numerous. From there, these components went on to overhaul valves almost entirely, with only specialist uses (such as high-end amplifiers or products with very high power requirements) retaining the elderly technology. The rest of us have taken the transistor entirely for granted. So, on the technology's 70th birthday, it's worth considering (if only for a moment) what your life would be like without it.